At about this time of year I am normally packing my season away in a box and thinking about what I am going to do over the winter. But this year I have extended my season, or to be more accurate, I have re-opened my season. After I ran Race to The Stones in July I didn’t have any other events in the diary. Three ultras felt like enough, beside which my feet were in shreds. A rest was on the cards. August was taken up with a variety of things. 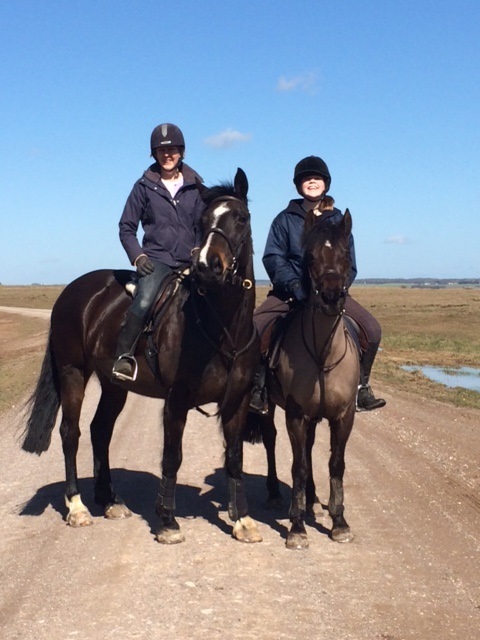 First we had to get Matilda and her friend to Pony Club Camp. Just two-girls, two ponies and a tent for a week, but it felt like a full military deployment. Then we had the all-important Race to The Stones barbecue. And of course we had our family summer holiday. This year we went to the south of Spain. Although I kept exercising throughout, my mind was focused on other things and there was no structure or purpose to my training. The result was that my weight and my fitness went in opposite direction, both heading the wrong way. If you allow yourself to put on weight and let your fitness ebb away slowly enough, you don’t notice the change. The realisation starts when you can’t find a T-shirt to run in that doesn’t show your spare tyre. 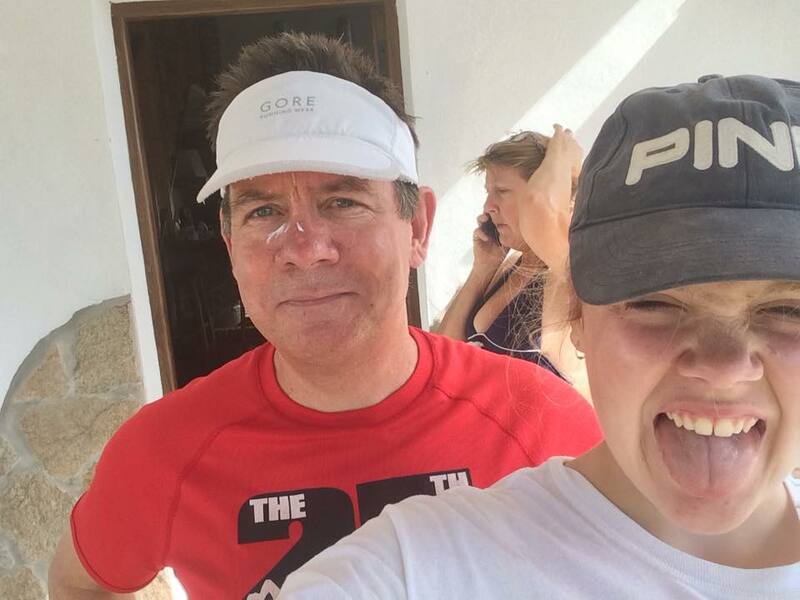 One of the positives of running on holiday – I persuaded Matilda to run with me!! But my “Road to Damasacus” moment came on a run while we were on holiday in Spain. It was hot and I was working quite hard, I would have guessed my pace was about 8.15 minute per mile, but my watch was showing my pace as 9 minutes a mile. In my state of denial I convinced myself that it was because I had an English watch and the GPS didn’t work properly in Spain. But I knew. The evidence that sealed the case, if any were needed, came when I got on the scales after returning from holiday. If they could talk the scales would have said: “One at a time please” before showing me a number I haven’t seen for a few years. That was it. Enough! Time to take myself in hand. So on the day after the August Bank Holiday, I declared my season open again and entered The Clarendon Half Marathon in early October. I got my bike out, dusted off my swimming gear and I went to it. I started training six days a week with the priority being running and in particular speed training and tempo running. I swam and cycled as cross training. I find that my run fitness rockets if I swim and bike on non-running days. At the same time I seriously cleaned up my diet. It only took a week before I noticed the early signs of improvement. As the end of September got nearer my numbers were improving and I had shed about 10 lbs. I am sure my training was paying dividends, but I am convinced that it was the weight loss that made the real difference. I have been doing parkrun for about a year but during that time I have never been at peak running fitness. 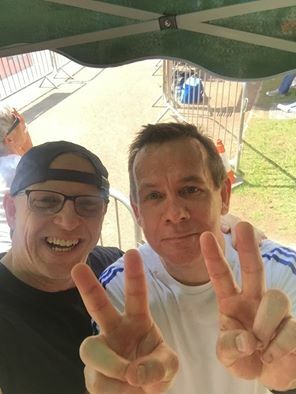 Recently I have been trying to go to parkrun every Saturday as it provides a good benchmark of progress as well as a really enjoyable social run with friends. Going into September I had a best time of 23.26 mins. One Saturday near the end of September I forgot my watch (which was working again by now!) so just ran to feel. I didn’t think I was hammering it, but nor was I holding back. I took 20 seconds off my best time. The following week I went back with my watch on with the aim of seeing what I could do if I gave it some beans. The answer, I took more than another minute of my parkrun PB which now stands at 22.05 mins. 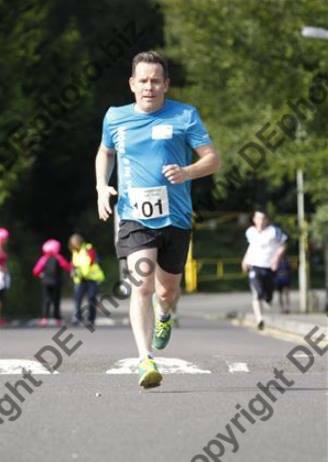 The previous week I had run a fantastic 10k in Andover in aid of the local food bank and come home in 46.30mins. (confession: I think the course was a bit short). Things were on the up. That was based on nothing. No science, no course recce and certainly no thought. Top of the head stuff! The look on Nev’s face told me that I was being a bit ambitious given the profile of the course, but he was polite enough not to say so. And anyway, it was too late, I had said it. It actually turned out to be the best thing that happened. My pace and progress during the race was always tantalisingly close to a 2 hour run, so when I was tempted to walk the hills I thought better of it. I had to answer to Nev at the finish line!! The most satisfying part was that moment when I thought I was dropping off the pace and I touched the accelerator and for the first time in eighteen months something actually happened! My training and weight loss had made a real difference. Always one to leave things to the last-minute, I sneaked over the finish line with 26 seconds to spare for a 1.59.34mins finish. On that course and given were I was five weeks earlier, I was thrilled. So that, in a rather large nutshell, is why I am continuing my season. I am enjoying my training and I am especially enjoying being a slightly faster runner again and I am not ready to go into winter hibernation. Next up is a step back in time to when I was at school. I have joined the local Athletics Club so that I can race in the Hampshire Cross Country League over the winter. For some people cross-country brings on flashbacks of cold wet torture from their schooldays. I have all kinds of great memories of running cross-country at school. It’s where I discovered my love of running, so I am quite excited to get out there. Sods Law, the first race is at Farley Mount in Winchester which is the site of the biggest hill in the Clarendon Half. At least I should know the course! Race to the Stones is now hurtling towards me at an alarming rate and I am now firmly into the sharp end of my training. There was a time when a 20-mile run was a major event in my life. Without wishing to sound blasé, they are now a fairly regular occurrence. 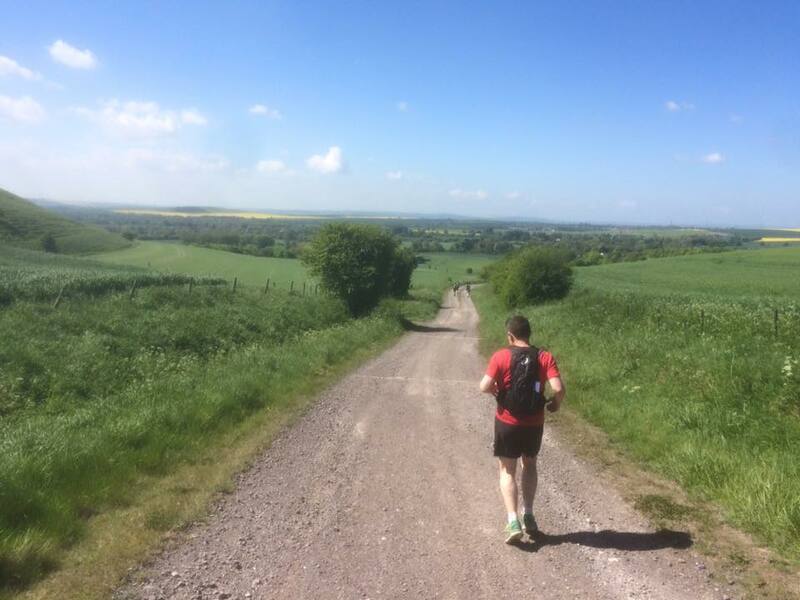 I rested for a week after the Marlborough Downs Challenge and then Cate, Matilda and I did another man vs horse run on Salisbury Plain, this time 20 miles. The horses threw the towel in after about 15 miles leaving me alone for the last five. If you think running with horses is strange, read on. My world of ultra-running was about to get a whole lot stranger. 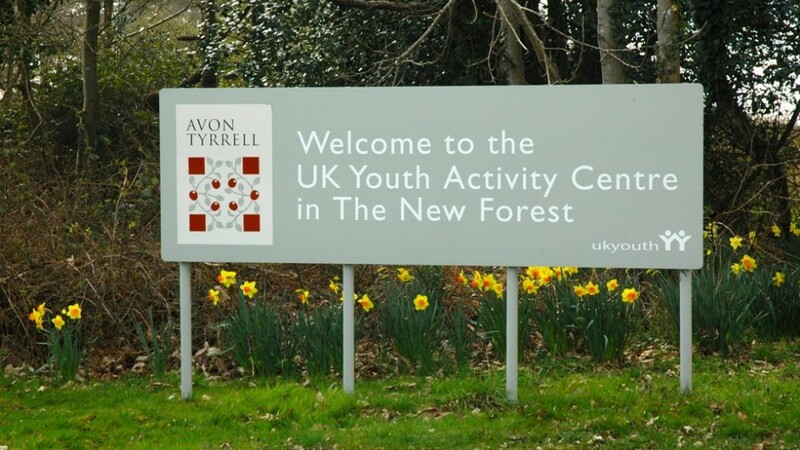 I wanted to put one really long run into my training plan and I decided to do it at the Enduroman Festival of Ultra Events, a 3-day festival of extreme endurance events held at the Avon Tyrell Activity Centre in the New Forest. Just reading the list of events made me tired. Amongst other things on offer was a single, double or triple Ironman or a 50, 100 or 200-mile ultra-run. I entered an event called “Run to The Max” which challenged competitors to run as far as they could in one, two or three days. I planned to do it on Sunday which was day three of the festival. As I pulled into the long driveway at Avon Tyrrel at about 6.30am on Sunday, I passed a zombie on a bicycle coming the other way. If he was doing the triple Ironman then he would be nearing the end of his 336-mile ride that had taken the best part of 24 hours before embarking on a 78-mile run that would consume most of the next 24. If felt as though I was entering a very strange parallel universe! I quickly found race HQ, had a 5-minute briefing before fetching my cold box and kit from the car. I found a space in the athletes’ tent which would be my base for the rest of the day, got changed and without any fanfare I set off. What I haven’t told you is that, to add to the torture, my 40-mile run was actually 37 times round a 1.1 mile circuit. Because the extreme distances mean some people are running right through the night, the course is designed to keep everyone close to Race HQ in case of problems. I had a breakthrough moment within 20 seconds of starting! The first 100 yards of the course are very slightly uphill. I felt fresh so I gently trotted up the hill. I turned round to see the guy I had just passed. With that we reached the top of the hill and he was off. His words stuck with me for the rest of the day. He was bang on! I learned later that he has done 105 Iron distance triathlons. I ran on with my head spinning in disbelief at what I was witnessing. Things weren’t helped when another runner on the first lap asked me if I knew what day it was! I got into a pattern of stopping every third lap for a drink and something to eat. I had a kid’s birthday party in my cold box. Everything from Mars Bars and Snickers to crisps, pork pies and real full strength coke. If I failed, it wasn’t going to be for a lack of nutrition. When I had done 12 laps, I quickly swung by the timing tent to check that they agreed with me. They didn’t!! Sod’s Law. Whenever there is a discrepancy it is never in your favour. They had me down for 10 laps. Of course they were right but that didn’t stop me feeling like I was running laps 11 and 12 again. A bit of a blow to morale. As the morning wore on I continued to tick off the laps. 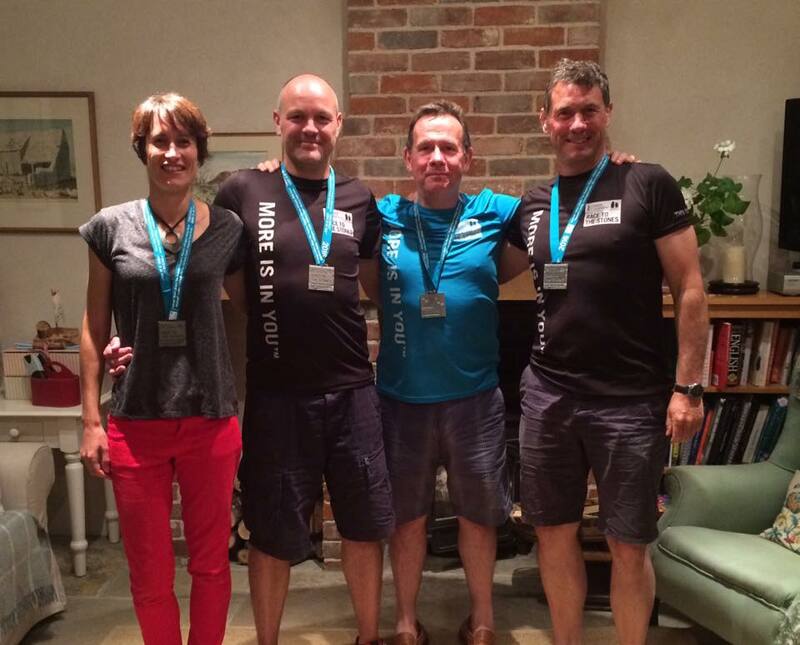 When I was at about 25 miles I got a real lift when Jason, Laura and Sam from our tri club turned up to support. Getting a shout and high five from them every 15 minutes put a bit of spring back into my step. At about the same time the old problem of sore feet began to rear its ugly head. They quickly went from sore to very sore. Every foot strike sent a little shock of pain through both feet. I tried all the usual tricks. Rest, elevating my feet, loosening my shoes but nothing helped. Then as a final throw of the dice, I begged some Nurofen from the support crew of a friend of mine. The difference was immediate. By the time I was halfway round the next lap, the pain had gone and I felt normal again. Enduroman was worth it for this one discovery alone! As the afternoon wore on so the bodies on the course became more and more battered. Some people had been on their feet for over 48 hours and it showed. I have never seen so many broken bodies. But in the whole time I was there I never heard anyone complain nor was anyone anything other than cheerful and friendly. The spirit was amazing. Although technically everyone was racing, at the heart of the Enduroman Community is a spirit of “we’re all in this together”. I have never witnessed anything quite like it. By late afternoon my lap count was into the thirties and I could literally count them down. Just a 10k, just a parkrun, until I found myself at the end of lap 36 – 39.6 miles done. Agonisingly short. One more lap! By far the coolest tradition at The Enduroman Festival is that you have to run your final lap the wrong way round the course. This means you pass all of the other competitors who are still out there. In true Enduroman style every single one of them, without exception, gave me a high five as I passed. 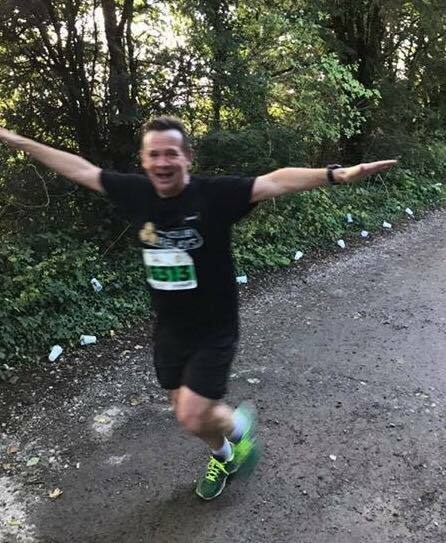 And as I reached the race HQ my finish was announced over the tannoy and everyone who was there stopped what they were doing and applauded me over the finish line. So 40 miles done. What I have learned? Well I have learned that I can run 40 miles which is a great confidence boost. I have also found a solution to my sore feet, although probably not a text book solution. But the best discovery I made was the existence of The Enduroman Festival. It was the most incredible day and I would love to come back a try another event in the future. For now it is a short rest and then back to the training. 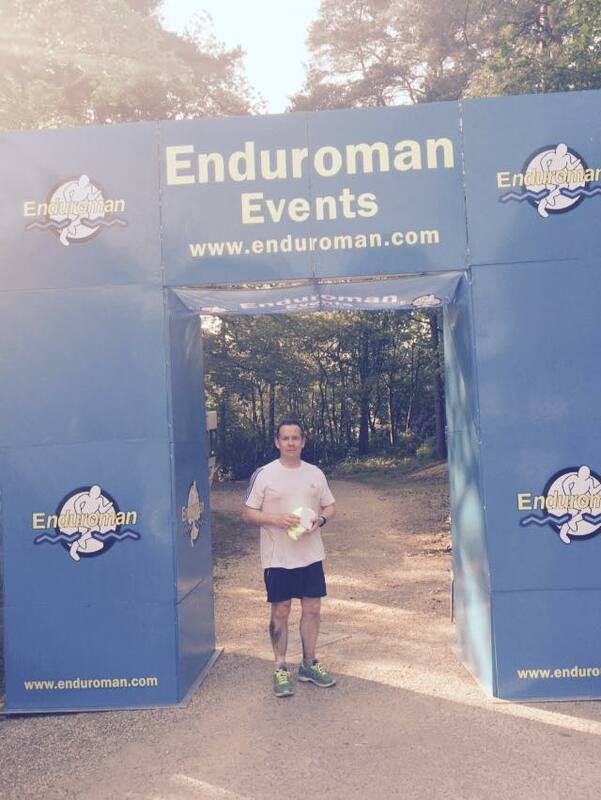 Although Enduroman will be my longest run before Race to The Stones, there is still plenty to do. There are now nine weeks to go until Race to The Stones and suddenly training has a very long feel to it. The weekend after Sid’s Morph Marathon was “only” a 20 miler! But then it was time to take a big step up in mileage. 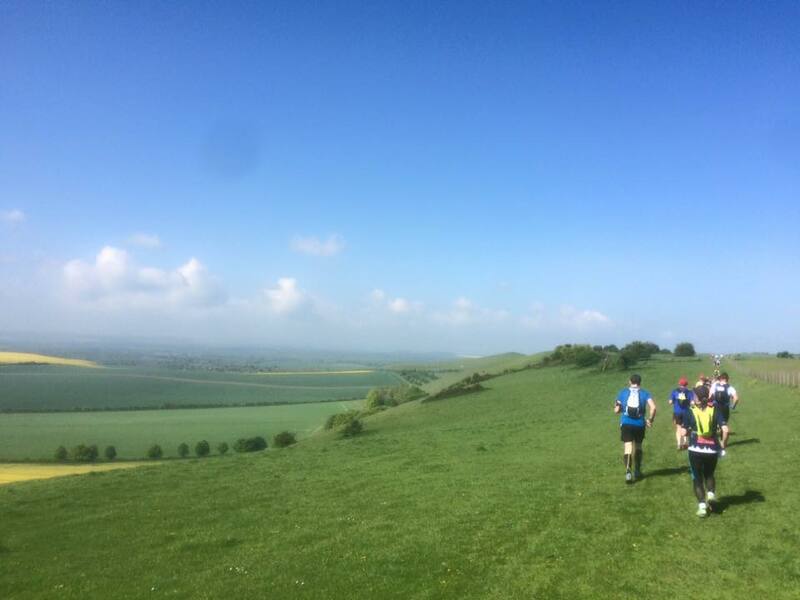 Nick and I had entered The Marlborough Downs Challenge, a local trail race. There was a choice of a 20-mile or 33-mile route. Being cautious I wanted to enter the 20-miler. Nick doesn’t do caution, he just wanted to kick its back doors in and show it who was boss. That is how I came to be standing nervously on the start line of a 33-mile ultra-marathon. The longest race either of us had ever done! We got our first taste of the ultra-running community at registration. 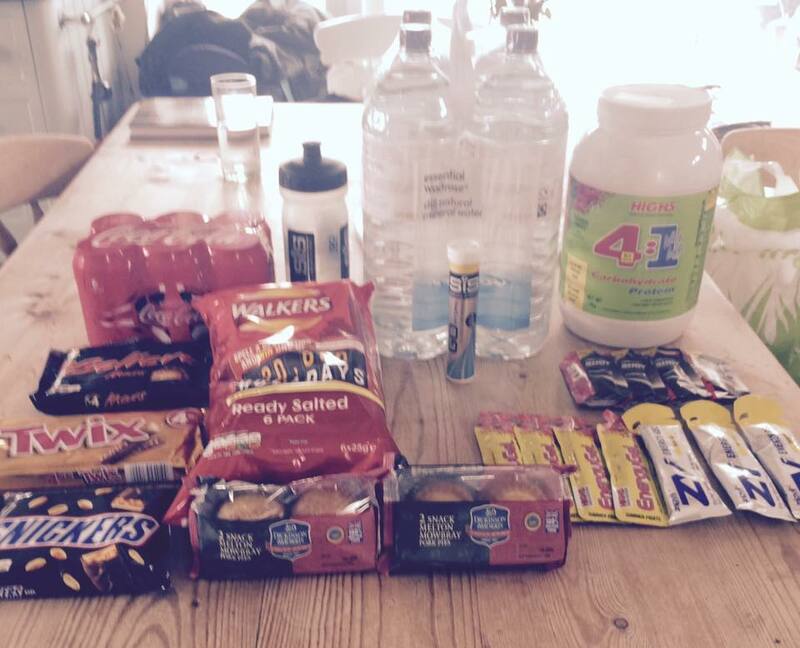 No fancy runners’ goody bag or rucksack here. Just a complimentary slab of Kendal Mint Cake and a knowing look. Ultra runners are an earnest crowd, but very friendly. 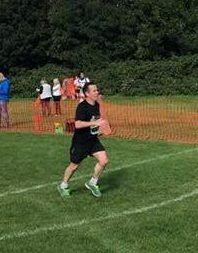 As we walked from registration at Marlborough Leisure Centre to the start line in the grounds of Marlborough College they regaled us with stories of how far they could run without water or their latest 100-mile run, without a hint of triumphalism. We suddenly felt a long way out of our depth. We didn’t help ourselves. 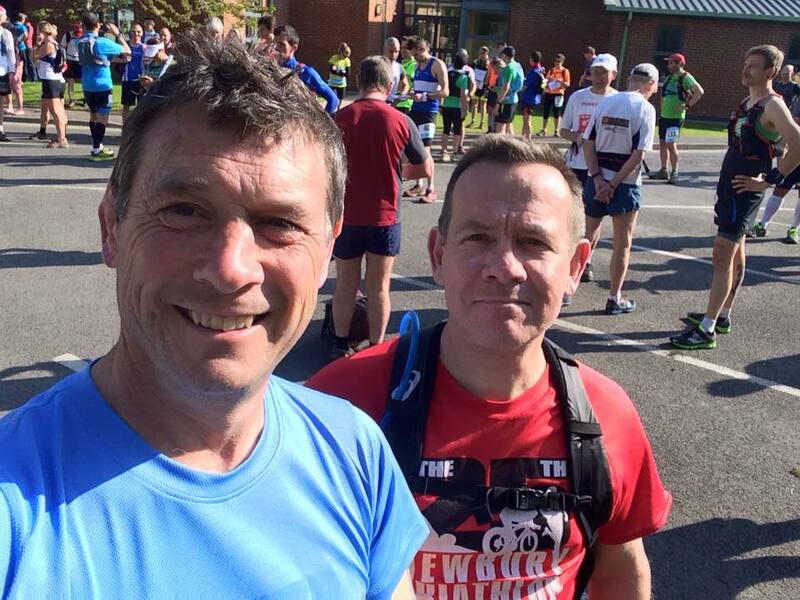 Rather than keep a low profile and blend in, we attracted lots of strange looks as we posed for a start line selfie to post on Facebook. I think these two ageing triathletes were something of an enigma to the ultra-runners. Bang on 9.00am we were off. Somehow I never doubted that the start would be punctual. It started with a long steady climb and within 15 minutes we were looking down on Marlborough and heading out onto the downs. We were blessed with almost perfect running conditions – blue sky, 150C and a light breeze. It was a lovely clear morning and the views out across Wiltshire were breath-taking. One thing you get lots of on an ultra-run is time. Nick is a countryman and so to fill the time, I was treated to a running commentary on the birds, the wild flower meadows and the state of the local crops (Nick’s speciality). It passed the time perfectly. After a long drag along the tow path of the Kennet and Avon Canal heading into Devizes, we were suddenly at half way where we celebrated with a Waitrose pork-pie. Apart from slightly aching feet, it was so far so good. But that wasn’t to last! There was a check point roughly every four miles whose first job was to confirm you were still alive and then feed and water you. Up to Check Point 4 we had always had other runners in sight and so had paid no attention to the route. Suddenly the field had spread out and there was no-one as far as the eye could see, but we just kept running. We first discovered we had gone wrong when we came to a dead-end in some woods. For the first time all day the detailed route instructions came out – all 8 pages of them! We retraced our steps and eventually saw some other runners and were able to re-join the route having only run about an extra half mile. The next big task was the long climb up Cherhill Down, the site of the White Horse. Next to the white horse is The Lansdowne Monument, a stone obelisk that you can see from miles around. All the way up Nick was grumbling that the organisers had failed to use the obelisk as a navigation feature in the directions. At no point did the alarm bells in my head ring to warn me that there was a good reason why they weren’t mentioned. Lost again! We recovered from that small deviation and from the top of Cherhill Down we hit a big chalk path that took us down to the main A4 on the floor of the valley. We could see the A4 in the distance and so assumed we just ran until we got there and so put the directions away for a while. Bad move. We sailed past a crucial turn and got horribly lost, our best yet! When we hit the A4 and the directions didn’t match what we were seeing, we decided to just run along the road until they did. That would have been a great plan if we had turned the right way along the main road. Instead, unbeknownst to us, we were running the wrong way and away from the race. It was only an eagle-eyed marshal spotting us as he drove past that saved our bacon. To cut a long story short we had run about a mile the wrong way which we had to retrace before we could start making progress towards the finish. After 23 miles of running, that was a heart breaker. From that point on we kept the directions in our hands and read them carefully at every turn. Motivated by sore feet, we didn’t get lost again! We ran most of the rest of race on our own. Inevitably in 33 miles of running (or 35 in our case!) we each had a low point, but not at the same time and so we managed to keep the show on the road. As we left the last check point we had 3 miles remaining. By now the biggest challenge was two sets of very sore feet and it became a game of picking the softest surface to run on, usually the grass verge. Slowly but surely we ticked of the last 3 miles and found our way to the finish line. By the time we got there it was literally one man – not even his dog. We had to rope a few bystanders in to give our finish line photo a bit of atmosphere. You could hear them muttering under their breath: “triathletes”. 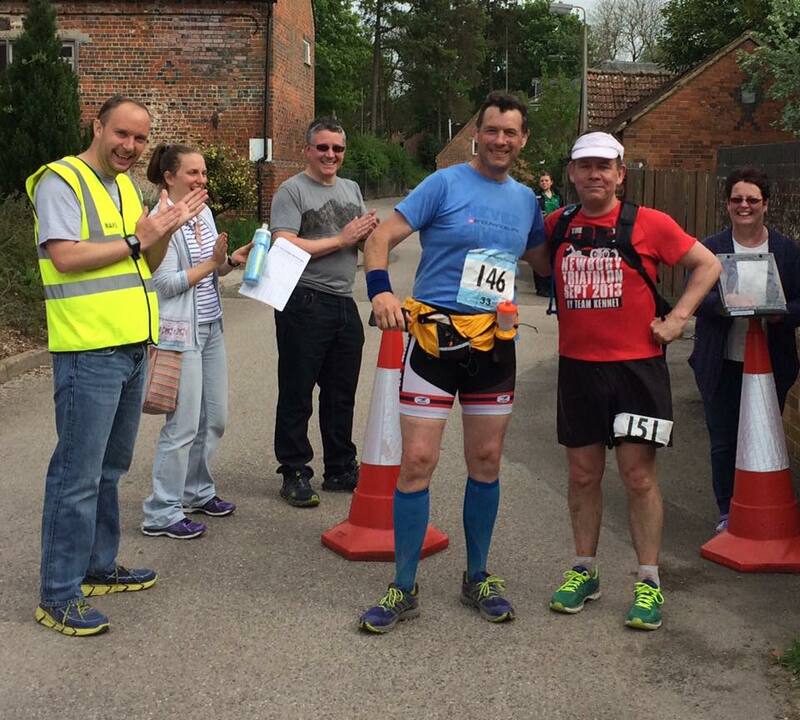 And to round off our day in the world of the ultra-runners the final peculiarity. No finishers medal here, just a mug. But not any old mug. It is a mug which says we are now ultra-runners.